Flag: Rectangle approx. 4:5 (photo image). White field probably charged with the CODECA logo. Caption to photo: "A movement of poor and indigenous people block sections of the Pan-American highway in Guatemala to protest against the decision by the country’s president, Jimmy Morales, to end the mandate of the UN-sponsored International Commission Against Impunity in Guatemala . . . "
Source of photo: (flipped image) “Politics.” The Economist September 15th - 21st 2018: 7. "CODECA (Comité de Desarrollo Campesino) is a human rights organisation based in Mazatenango, Suchitepéquez, Guatemala. Since 1992, CODECA has been working on improving the situation of the rural poor in Guatemala, focusing on issues such as the wage conditions for farmers, land reform and nationalisation of electric energy in the country." The flag of the Guatemalan National Revolutionary Unity (Unidad Revolucionaria Nacional Guatemalteca) uses the national colours. It is a light blue flag (the same shade than the national flag) with the initials in white. Those colours are also used on scarves, banners, t-shirts, etc.. The logo of the party contains the initials in blue (on white background) and a panocha (corncob) of yellow corn with green trunk. - ORPA (Organización Pueblo en Armas, Revolutionary Organization of Armed People). Founding Philosophy: The Guatemalan National Revolutionary Unity (URNG) was an umbrella organization (guerrilla movement) that emerged in Guatemala in 1982. It represented the principal leftist organizations, who embodied a mix of insurgent warfare, terrorism and political activism. The URNG was formed by four Marxist groups active in Guatemala in the 1970s: the Guerrilla Army of the Poor (EGP), the Revolutionary Organization of Armed People (ORPA), the Rebel Armed Forces (FAR), and the Guatemalan Labor Party (PGT). 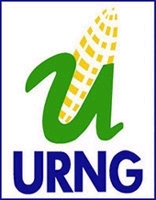 After the merger, the URNG became the principal opposition group in the Guatemalan Civil War, which had pitted right-wing governments, often dominated by the military, against a number of left-wing groups. Combatants in the civil war also included right-wing paramilitary groups, sometimes known as "death squads." Despite the official merger of the three groups into the URNG, each maintained its own leadership structure; terrorist attacks were claimed most often under the name of the individual group, not as the URNG. Current Goals: The Guatemalan Civil War ended in 1996. Since then, after a peace process brokered by the United Nations it laid down its arms in 1996 and became a legitimate political party in 1998. It now operates as a peaceful political party. There is also a white flag with the logo. There was an interesting, if harrowing, BBC World report the other night on the effects of war on women, dealing specifically with such countries as Guatemala and Congo. Part of the programme included a short interview with a spokeswoman for the Guatemalan Republican Front political party (FRG).. Image based on www.wepa.com.gt/mln reported by Christopher Dent. The party is called Movimiento de Liberación Nacional (Movement of National Liberation) and, assuming it's flag is as represented in the symbol, it is a vertical tricolour of blue, white and red, charged with a blue dagger or sword in the white band and the initials along the bottom, each letter in it's band and with contrasting colours. Meaning that the M and the N are white and the L is blue. 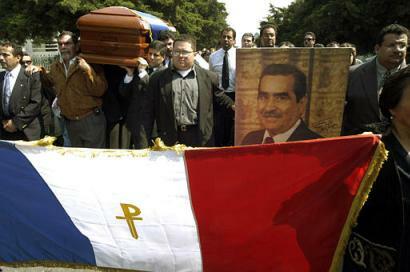 There is a photo at story.news.yahoo.com with the inscription: "Relatives and supporters of former Guatemalan Vice President Mario Sandoval Alarcon carry his coffin along with a flag of the National Liberation Movement during the funeral service at the general cemetery in Guatemala City on Friday, April 18, 2003. Sandoval, who served as vice president between 1974 and 1978 in the government of Gen. Kjell Laugerud, died Thursday at the age of 79. (AP Photo/Jesus Alfonso)". If I recall correctly a similar design to the above with different inscription was used by one of the guerrilla movements in Guatemala. The image is most likely the flag of the EGP (Ejército Guerrillero de los Pobres, Guerrilla Army of the Poor) which depicts a face of Ernesto Guevara de la Serna, a. "El Ché". The Patriotic Party (Partido Patriota) is a right wing political party in Guatemala. It was founded on 24 February 2001 by retired Army General Otto Pérez Molina, who won the last presidential election in Guatemala in November 2011. He was elected president with 54% of the vote, and he assumed his office on 14 January 2012. The party flag is plain white with party emblem placed in the center of the flag. The party emblem is made of a white fist placed over an orange disk outlined in white and orange. The party name is written in blue capital letters, on two lines. "The fist means liberty, firmness, strength and the commitment of the Guatemala people to build a better future. The disk symbolizes unity and solidarity, a characteristic of the party and of all the patriots who love their country. Orange and the stylized line represent dynamism and action, a characteristic of all patriots committed to the country's welfare. To build a better future, the country needs men and women who promote liberty with firmness and character."